Few relationships are as complex as the mother—daughter bond, that web of interconnecting threads coursing through both lifetimes. Editor Kathryn Kysar, writer and poet, examines this bond in twenty-one essays by daughters of various ethnic backgrounds. Women of African, Hispanic, Asian, Caucasian, and Native American heritage write with clarity and sensitivity about their relationships with their mothers and grandmothers. The relationships are sometimes troubled, but all the essays show the compassion with which these adult daughters view their mothers’ struggles as parents in the early- to mid-twentieth century. Even in painful interactions, daughters still learned from their mother’s strengths. In “My Mother is a Garden,” Denise Low describes the frightening unpredictability of her mother’s volatile temper. Yet this mother felt equal to any man, and built a stone patio herself when her husband refused to help her. The daughter understood that women could be physical and independent. 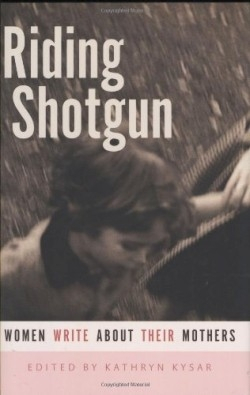 The title Riding Shotgun is taken from Morgan Grayce Willow’s “Riding Shotgun for Stanley Home Products.” In this essay, a tired young daughter is charged with keeping her mother awake late at night as she drives back from hosting a home products party, a way to make extra money for her farm family of nine children. The daughter feels exhausted, but realizes mother has been up since before dawn. In “Grown Folks’ Business,” Taiyon Coleman expresses thankfulness that her African American mother had the strength to leave an unfaithful husband at a time when divorce and single parenthood were viewed with great disapproval. When the daughter herself faces divorce, she knows her mom won’t condemn the decision. Some essays are celebratory. In “My DocuMama,” Anne Ursu describes her mother’s ability, at the age of sixty-three and without any film training, to produce a documentary good enough for PBS. Other essays delineate the importance of grandmother connections, even when grandmother isn’t a blood relation. Heid Erdrich learns to honor her Native American heritage from a “grandma” who was her mother’s close friend. And Faith Sullivan delights in her extended family of grandma and friends, a “klatch of mothers” who canned food, read tea leaves, played cards, and laughed exuberantly, in spite of hard work and financial struggles. Anyone who is a mother or a daughter will find these essays illuminating, even when the relationships feel broken in places. As Elizabeth Andrew comments, “Brokenness lets in light. See all these women? We shine.” They certainly do.